Susan Assouline is on a mission to help twice-exceptional students reach their full potential. Twice-exceptional students are gifted and talented but also have a physical disability, learning or social impairments including autism spectrum disorders and specific learning disabilities, or other conditions like attention deficit hyperactivity disorder. Assouline—professor of school psychology and associate director of the UI College of Education’s Connie Belin and Jacqueline N. Blank International Center for Gifted Education and Talent Development—and colleagues Megan Foley Nicpon, Claire Whiteman, and Nicholas Colangelo have drawn national attention to these students. They’re working on a five-year project to develop a National Institute for Twice-Exceptionality—the first of its kind in the nation. The institute aims to help psychologists, counselors, and educators across the country better serve these students and their families. Assouline recently spoke with Spectator@IOWA about her interest this population, the new institute’s role as a catalyst for helping twice-exceptional students, and what society loses when these students don’t get support from trained educators. Tell us more about twice-exceptional students. What does it mean when we describe a student as twice exceptional? In the gifted education world, twice-exceptionality refers to individuals who have exceptional academic, artistic, or leadership abilities, yet also have one or more diagnosed or diagnosable disabilities that diminish the likelihood of realizing their full potential. In some cases, the disability may be masking the giftedness. In other cases, their strengths may hide their disability. How did you get interested in studying and helping this population? When I started as an educator, the rules and regulations for special education were brand new. I was a classroom teacher fascinated by students who received special education services, and I decided to pursue an advanced degree in order to work more directly with them. Along the way, I discovered that there are two sides to the world of special education. I was fortunate, because that discovery happened just as the Belin-Blank Center was founded. Are our schools prepared to help identify and support these students? In some areas, schools are definitely prepared, whereas other areas represent opportunities for growth. Part of what makes preparedness challenging is the ever-changing educational landscape. For example, one positive change has been the willingness of gifted educators to learn about these issues and become better advocates for their students. At the same time, we have seen a positive shift in attitudes about academic acceleration for twice-exceptional students. Because of this shift, when a gifted educator is asked about acceleration for a student with a social impairment severe enough to be diagnosed with an autism spectrum disorder, or ASD, that educator is better positioned to advocate for acceleration and encourage appropriate support to address the ASD. Previously, acceleration might have been denied because of the student’s social difficulties. On the other hand, some changes to special education regulations have made advocacy for twice-exceptional students more challenging. These include changes that impact ways of diagnosing specific learning disabilities. For example, some states have eliminated comprehensive learning disability evaluations of students because professionals thought such evaluations created a “wait to fail” system. But without a comprehensive evaluation, gifted students with a specific learning disability fail to flourish and are almost always left behind. 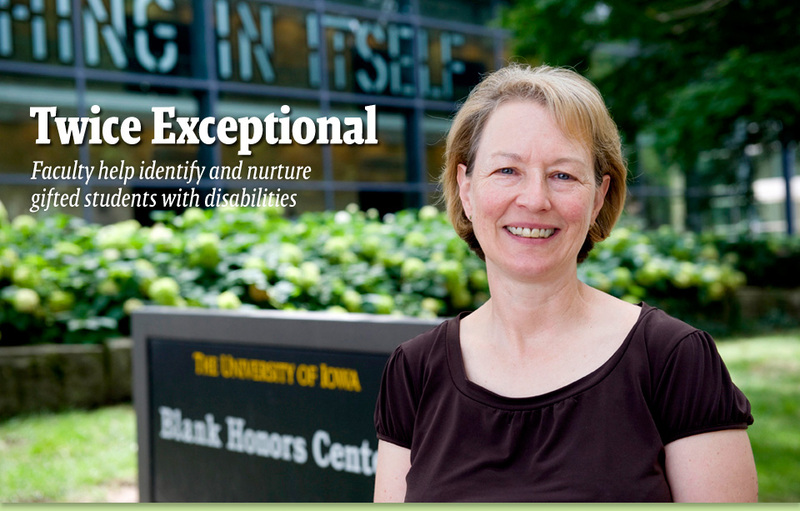 Since 2005, the Belin-Blank Center has conducted a comprehensive twice-exceptional study. What has the research revealed? • A thorough, comprehensive assessment is absolutely critical to diagnosing a disability and discovering giftedness so appropriate interventions and programming can be implemented. • Gifted educators are essential to facilitating appropriate programming for students. • Current systems of identification for gifted programs, which typically focus on an all-around gifted individual, may miss twice-exceptional students. • Early intervention is crucial, but can only happen with early assessment. • University-based gifted programs like those offered by the Belin-Blank Center, provide important opportunities for twice-exceptional students; however, such programming does not replace the need for intervention in the K-12 setting. Why has so little research been done in this area? Psychologists typically conduct this research in university settings, but that’s neither where the students are nor where interventions need to be implemented. That’s what makes the National Institute for Twice-Exceptionality unique. We aspire to bridge the gap between research institutions and K-12 settings, primarily though assessment of students and dissemination of information to educators and parents. How might a parent or educator become aware that a student may be twice exceptional? The parent will notice discrepancies between potential and performance. For example, a student may be highly verbal, have an excellent vocabulary, and make wonderful oral reports, but cannot write out his or her assignments. Rather than assuming the student is stubborn or unmotivated, we recommend a comprehensive assessment to identify any additional concerns. As another example, some brilliant individuals have great difficulty relating to other people. Is this because they have a debilitating social impairment such as an ASD, or because they are in an academic setting where they have no peers? Again, only a comprehensive assessment with a specially trained psychologist can provide insight into this situation. Are there famous or influential people who were either officially identified as twice exceptional or who, looking back, might have been? I try to stay away from retrospective diagnoses! At various times, Albert Einstein has been diagnosed as having a learning disability or an attention deficit disorder. Perhaps he also had an autism spectrum disorder? But you can see the possible danger here—most twice-exceptional individuals are just like people in general. They are not Einstein, with or without a disability. If Einstein had a disability, it’s not what made him an exceptional physicist, but some will try to draw that connection. What size population are we talking about? Inconsistencies in defining giftedness and determining disabilities make this a difficult question to answer. That being said, one published estimate is 360,000 students nationally. People may assume that the overall prevalence of twice-exceptionality is extremely rare and only reflected in extraordinary individuals such as Albert Einstein. In actuality, the numbersand the human potential they representare quite significant. What is the impact on students and society if we don’t help this population? I don’t think it’s an exaggeration to say the twice-exceptional population is tremendously underserved in our schools. The key to gifted and talented programming is to first discover the talent area, then develop it. If a disability obscures the talent or makes it difficult to develop, we all lose out because another student has been left behind.